dilcorkswim@gmail.com and tell us your name please. To coincide with the Pieta House Darkness into Light Events, (See their page here) we are holding a Darkness into Light Swim at Myrtleville (as an alternative to the 80 runs being planned that morning!). Meet by 4:40am & Swim at 5:00am on Sat 6th May (Civil Twilight is at 05:15, Sunrise is at 05:55). Respect the time of day – arrive quietly, avoid shouting, slamming doors etc, common sense really, just be mindful of the sleeping residents. There will be a donation Bucket for contributions to Pieta House. Safety Briefing at 4:55am (and we will number everyone’s hands for check-in/check-out). Please report your number on the way out. Swim a Max of 30mins (for safety reasons, please adhere). Whatever your speed, turn back after 10-15mins. 5mins is also an acceptable swim time. DO NOT swim on your own, swim in 2s/3s, stick with your swim buddy so you can talk to them to check in with each other, don’t swim in huge groups, you’d be calling names all the time and your voices will travel over the water!. There will be less stop/starting with smaller groups. We will meet at the bottom of the steps at 4:45, away from the houses to make sure we are all glowing. As the colour of Pieta House is yellow, if you have a yellow hat, or a hat with yellow in it, wear it, it’ll be our nod to the Cause. Remember it’s only May, expect the air to be cool at that hour. Have the layers of clothes ready for after the swim, and of course the Hot Flask for a cuppa!. Bring a Flash light, you’d be surprised what you can’t find in the dark in the car! As this is a night swim (to start), swimmers must have glow sticks on their hats and togs/wetsuits. There is a link below to show you what the disposable single use glow sticks are like. These are an ideal alternative to the pricier reusable light (but that does have hundreds of hours light on it). It’s worth it to buy a batch of the snap&glow sticks if you will be doing more night swims over the next year or so! There are cheap jewellery disposable versions in EuroGiant/Dealz etc, but these are not very bright out at sea and they tend to not stay in place too easily (they are not really made for sea swimming!). These should only be used as fun top-ups to the better stronger glow sticks. Plan ahead, do some research online, pair up with someone to share the costs of buying the glow sticks (share shipping costs etc). Check these out on Amazon as an example of what you are looking for, for one time use, glow sticks. There is also an Irish Website that sells them. The reusable night lights for your goggle straps are Called ‘Guardian Adventure lights’ (they can be bought in Centra Crosshaven or CH Marine, Cork). If you want to buy them online, just Click! And Really this is a Finally, If anyone is willing to help out and stay on the beach while we swim and count us in/out, we’d love to have you, and also, anyone willing to kayak, we’d love to have you there too.. We’ll feed you coffee and cake (well, maybe not cake at 5am, but the offer stands!). 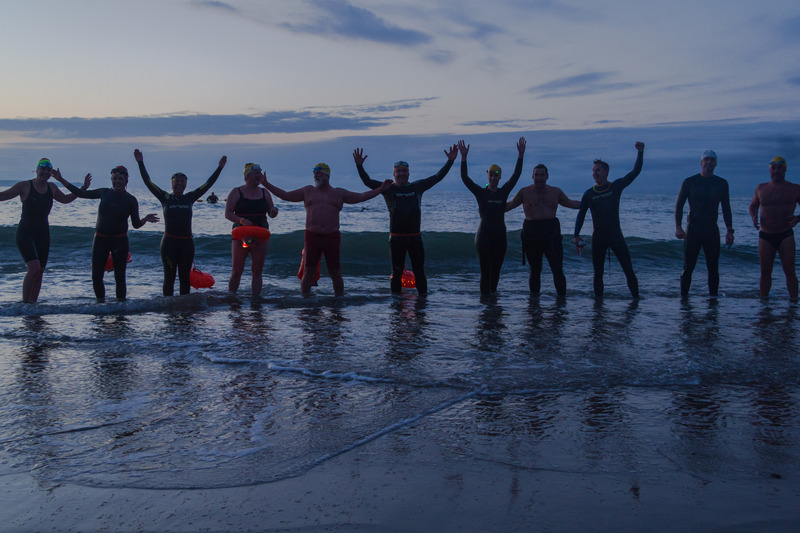 This entry was posted in Events and tagged Darkness into Light Swim, Open water swimming - Cork, Open water swimming - Cork - Ireland, Sea swimming - Cork, Sea Swimming - Cork - Ireland by myrtlevilleswimmers. Bookmark the permalink.